New Visiting Days & Hours beginning Tuesday, February 19th, 2019. Create your Inmate Video Visitation account at iWebVisit.com remotely. 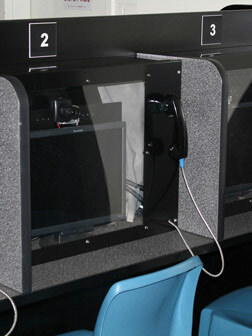 Remote Web-Based Video Visitation is available to general population inmates. General Population inmates are allowed up to 2, twenty-minute Remote Video Visits per Day, Monday through Friday from 8:30 am to 11:00 am and from 7:30 pm to 10:30 pm. Saturdays and Sundays from 8:30 am to 11:00 am and from 1:00 pm to 6:00 pm..
WCSO may limit or cancel jail video visits at its discretion. Except for attorney and other confidential visitors, all video visitations are subject to monitoring and recording. WCSO may terminate an inmate’s privilege to have video visitation at its discretion and may also terminate an on-going video visitation due to security reasons such as lock downs or during periods when visitations are suspended. Both WCSO and iWebVisit reserve the right to terminate a visitor's visiting access due to fraudulent activity, inappropriate behavior during a visit, or improper conduct toward staff. Remote Web-Based Video Visitation is available to special management inmates as set forth below in the On-Site visitation chart. You must create an account at iWebVisit.com remotely. Attorneys are permitted to visit remotely with an inmate each day. The attorney must create an account at www.iwebvisit.com. The attorney must also obtain approval in person one time at the jail to obtain confidential status by providing photo identification and a state bar card. If the attorney fails to obtain the confidential status, all video visits will be recorded. Inmates are allowed visits based on their current housing status. There are no visits for inmates who have not completed medical asessment. This usually takes 3-4 days to complete. NOTE: Inmate Visiting can be cancelled at any time. We suggest you call before visiting. Secure lockers are available in the lobby, free of charge. Visitors may be subject to a personal search at any time. Visitors that refuse to be searched will be denied access. Possession of illegal substances, possession of concealed weapons, attempts to pass contraband, and defacing public areas will result in arrest. Visitor's clothing must conform to proper dress standards. Final determination will be made by detention facility personnel. Anyone failing to comply with these rules will be denied access to visiting. Inmates may receive visits upon being assigned to a Housing Unit. Visiting schedule is based the individual's Classification Status.